The Sixth Plenary Research Data Alliance (RDA) Meeting to be hosted in Paris from 23-25 September 2015, will feature a special focus on research data for climate change, leveraging on the UN Climate Change Conference (COP21) to be held in Paris in December 2015. As a part of this special focus Cap Digital & RDA have created a special Challenge designed to connect Climate Change related Data Sets with startups, subject matter experts and larger organizations with practical application for these data. In addition to a description of the datasets, we would also like to receive indications on the possible applications that might constitute a challenge goal. Submissions must be made on-line and are accepted until midnight CET 21st May 2015. For any queries please contact p6-challenge@rd-alliance.org. Challenge announcement and publication on a dedicated web platform during Futur en Seine, the international digital festival in Paris in June. Demo of the winner’s solution and data set during the UN Climate Change Conference (COP21) in December (to be confirmed). CartoDB, a company that creates tools to help people visualize and analyze geospatial data, is launching a grants program to help nonprofits and communities understand and prepare for climate change impacts using data. 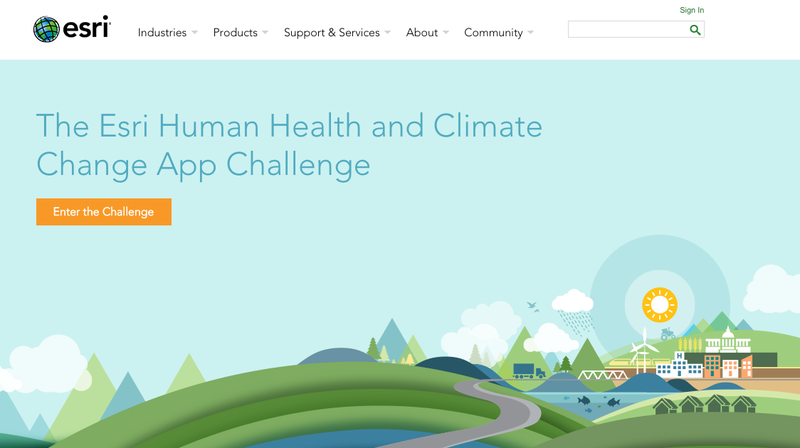 Esri’s Climate Change and Human Health App Challenge is open to everyone – including developers, start-ups, governments, academics, and NGOs to name a few. Get creative for this important initiative by using the growing pool of open data and Esri apps, maps, services, and APIs. Judges will select the best of the best apps to be featured at Esri’s Health and Human Services GIS Conference. Esri will award prizes and share the winning apps on our Collaborative Resource Portal. With over $35,000 in prizes, NASA, in partnership with USGS, will host the Climate Resilience Data Challenge — an effort to spur data innovation in support of resilience in communities and ecosystems. Through the NASA Tournament Lab hosted on topcoder, the Challenge will kick-off on December 15 and last for three months, starting with an ideation stage for data-driven application pitches, followed by storyboarding and prototyping of concepts with the greatest potential. The winning ideas can one day be implemented on the web and will inform the development of earth science web services. For more information, the new NASA Earth Science Challenges provides key details about the launch of contests, timelines, and additional resources. NASA is launching two challenges to give the public an opportunity to create innovative ways to use data from the agency’s Earth science satellites. The challenges will use the Open NASA Earth Exchange. OpenNEX is a data, supercomputing and knowledge platform where users can share modeling and analysis codes, scientific results, knowledge and expertise to solve big data challenges in the Earth sciences. A component of the NASA Earth Exchange, OpenNEX provides users a large collection of climate and Earth science satellite data sets, including global land surface images, vegetation conditions, climate observations and climate projections. For more information, see the NASA OpenNEX Press Release and the OpenNEX site. The United Nations Office for Disaster Risk Reduction (UNISDR) launched the Making Cities Resilient Campaign to improve land use and urban planning for 1,800 participating cities worldwide. City planners everywhere are designing programs for the sustainable use of energy and natural resources. Many are making plans that fortify their cities against the onslaught of natural disaster. Esri is collaborating with UNISDR on the initiative and giving these cities access to its desktop and developer technology. Esri calls on the developer community to lend a hand by including the ArcGIS Platform in the development of new apps for urban resilience. Coastal communities are becoming increasingly vulnerable to the risk of damage from coastal inundation. We only have to remember the recent impact of Hurricane Sandy on communities in the northeast to see the potential damage that a single storm can cause. This featured challenge of the International Space Apps Challenge is to create tools and provide information so communities can prepare for coastal floods. Through the use of data, visualizations, and simulations, you can help people understand their exposure to coastal hazards and their increased vulnerability due to population increase and sea level rise. Visit the resources tab to find datasets, web services, and tools that will help you compete in the Space Apps Challenge on the coastal impacts of climate change. Want to create an app about climate? 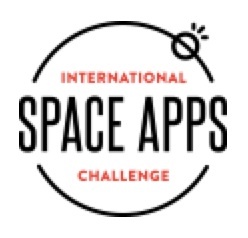 The International Space Apps Challenge is an international mass collaboration offering four climate-related challenges. Space Apps is a two-day event (April 12-13, 2014) that has about 40 challenges organized around Earth and space themes (see sample challenges below). Teams of technologists, scientists, designers, artists, educators entrepreneurs, developers and students across the globe collaborate and engage with publicly available data to design innovative solutions for global challenges. Visit the Resources tab to find datasets, web services, and tools that will help you compete in the Space Apps Challenge on the coastal impacts of climate change. Coastal communities are becoming increasingly vulnerable to the risk of damage and danger from flooding. Your challenge is to create tools and provide information so communities can prepare for coastal inundation. Through the use of data, visualization, citizen engagement, and simulations, you can help people understand their exposure to coastal inundation hazards and their increased vulnerability due to population increase and sea level rise. What apps would you build if you had access to climate projections for the rest of this century? How would you visualize these climate projections and their impacts to effectively engage policy makers, managers, planners, educators, and the general public? This challenge focuses on the creation of a visualization interface that would allow location-specific access to climate data sets using coordinates specified by the user or from mobile devices. Create a sensor kit to measure temperature and relative humidity in several locations in real time. You could also create a real-time micronet of sensor kits and use their data to understand local environmental conditions. This data could even be used to educate the community about the urban heat island effect, weather, and climate. Create inspiring and actionable community plans about climate adaptation. Communities can prepare for climate change in plenty of ways and base their plans on the latest scientific data. Work with community residents, urban planners, and city officials to create these plans so they are realistic and reflect community needs. You can use scientific visualizations, imagery, data, graphics, and artist renderings as motivation and inputs for creating detailed maps and plans of action for the next 10, 20, or 50 years. Learn about the Esri Climate Resilience Challenge, which challenges innovators to develop apps and maps using the Esri ArcGIS Platform to help communities, see, understand, and prepare for climate risks. Apps may help communities prepare for, react to, and recover from, severe events caused by climate or enabling every day changes to reduce our carbon footprint. They could address challenges in public safety, transportation, economic development, healthcare, and more.